Teaching A Child To Crochet (see link below) is a wonderful resource for both beginner and experienced teachers. It is used in the Craft Yarn Council of America's Certified Instructors Program and is reprinted here with their permission. 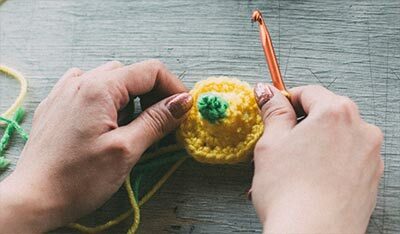 While it is specifically geared to meeting the challenges of teaching young people how to crochet, the principles are the same for knitting and for teaching students of all ages. Another helpful "tool" in teaching children to knit is a descriptive verse or mnemonic rhyme, Check out "A Poem to Knit By" for two verses that have been used with great success by teachers. The Council also offers more helpful information at its Learn to Knit and Learn to Crochet web site (see link below). There are how to visuals, FAQs and explanations about different yarns. At their Yarn Standards & Guidelines web site, you'll find explanations about yarn weights, needles and hook sizes, plus a list of abbreviations commonly used in knit and crochet patterns. The Council also sponsors a program called Each One Teach Two. At the web site (see link below), there are helpful instructions sheets for teaching both crocheting and knitting. In addition, there is a Certificate of Achievement, which can be downloaded as a PDF, and a Teacher's Award Program, which offers participants an opportunity to win prizes for teaching others. We also encourage you to visit the Books & Helpful Resource section at this web site for lists of books and supplies geared to children and teens, as well as links to more helpful web sites. 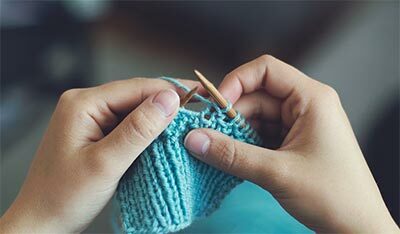 And at the Teachers Stories section of this web site, educators provide first-hand experiences in organizing knitting and crocheting classes. There are valuable teaching hints and insights. In addition, Cat Bordhi shares detailed knitting lesson plans, along with an extensive bibliography. What If You Need to Find A Teacher? Whether you already know how to knit or crochet or not, you may need help teaching and there are resources that you can tap. Relatives and friends of students or members of local senior centers could be potential volunteers. Another talent source is your local yarn store or department at local craft stores. At the Craft & Hobby Association's Teacher Place Web Site, there is a helpful store locator as well as other resources. There also are crochet and knitting guilds that might be willing to assist you. Below are links to The Knitting Guild Association and the Crochet Guild of America. At their web sites you can search for a local guild in your area. Finally, there is a very special project called the NeedleArts Mentoring Program. Sponsored by the Helping Hands Foundation, the goal of this project is to "create community partnerships that promote and encourage relationships between adults and youth, fostering curiosity, creativity and a feeling of achievement through the teaching of needlearts." There is a nationwide network of mentors that do nothing but help teach young people how to crochet, knit and do a variety of needlearts. There's a link below to their web site as well.